ਅੰਕੜੇ ਇਕੱਠੇ ਕਰਨ ਲਈ ਆਪਣੀ ਰਿਹਾਇਸ਼ ਦੱਸੋ। ਤੁਸੀਂ 'ਅੱਖਰ' ਕਿਹੜੇ ਦੇਸ਼ ਵਿੱਚ ਵਰਤੋਗੇ? ਤੁਸੀਂ ਕਿਹੜੇ ਦੇਸ਼ ਵਿੱਚ 'ਅੱਖਰ' ਪ੍ਰੋਗਰਾਮ ਵਰਤੋਗੇ? 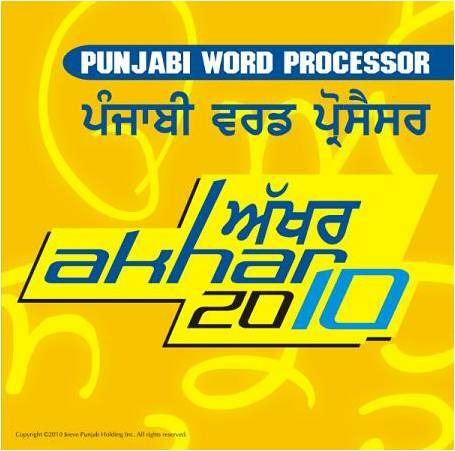 Akhar 2010, the bilingual Punjabi-English word processor has been developed for word processing under the Windows environment. It provides a number of features that make the use of Punjabi Language on a computer easy and provides a number of tools that automate and simplify the creation and formatting of documents. Akhar2010 provides most of the features that are normally found in a WYSIWYG (What you see is what you get) word processor. Akhar2010 is completely compatible with MS-Word. All the files created in MS-Word can be opened and edited in Akhar2010 and the files developed in Akhar2010 can be modified in MS-Word. • Support to Type Punjabi in Roman script and automatically convert it to Gurmukhi. Only small case letters used which fastens up Punjabi typing as shift key not pressed. Software intelligent enough to identify the corresponding letter and words in Gurmukhi. • English words such as typing, computer etc which are commonly used in Punjabi can be typed using English spellings and software converts them to corresponding Gurmukhi words. • Abbreviations such as USA and TV can be typed as such in capital letters and get converted to Gurmukhi. • Words can be typed according to the pronunciation in English and they get converted to equivalent Gurmukhi words (first sentence of above fig). • Software flexible enough to understand different ways of writing a Punjabi word in Roman (Second sentence in above fig). • All the possible forms in Gurmukhi displayed (shair in above fig). • The software uses artificial intelligence techniques, database of 74 lakh Punjabi words, a Punjabi Dictionary of 1.5 lakh words and an English-Gurmukhi Transliteration dictionary of more than 20,000 commonly used English words to cleverly guess the most appropriate word. As in above fig. words badal and khan are pronounced in more than one way in Punjabi and the software correctly guesses them. • Punjabi Typing becomes very simple and fast. • Useful tool for Punjabi learners. • Composing emails in Punjabi simplified. • Telephone Directories and examination records of Punjabi can be converted from English to Gurmukhi with click of mouse. • Thirty most common Punjabi words, which cover more than 25% of Punjabi text can be typed by just clicking on the buttons on the onscreen keyboard. • Hints displayed as the user moves the cursor on any key. • For certain fonts, the keyboard also checks for illegal character combinations and does not allow such grammatically incorrect combinations as an addak followed by a bihari. • Punjabi-English spell checker provided for both languages. 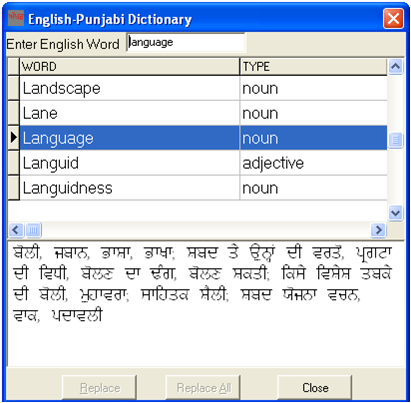 • Punjabi spell checker works on any of popular Punjabi fonts. • Additional dictionary of Gurbani provided to check for Gurbani spellings. • Powerful suggestion list provided, which gives the most appropriate word at the top of the suggestion list. • English-Punjabi dictionary provided containing around 30,000 words. • Dictionary can be invoked by double clicking on any English word in text and it will display its Punjabi meanings. • English word can be replaced in the main text with its equivalent meaning in Punjabi by selecting it and clicking on Replace button. 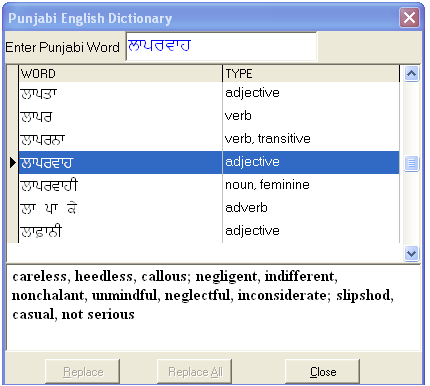 • Punjabi-English dictionary provided containing around 20,000 words. • Dictionary can be invoked by double clicking on any Punjabi word in text and it will display its English meanings. • Punjabi word can be replaced in the main text with its equivalent meaning in English by selecting it and clicking on Replace button. • Font conversion between more than 125 commonly used Punjabi fonts such as AnmolLipi, DrChatrik, Satluj, Joy etc. • Multiple Punjabi fonts can be present in same text. • English text in the document remains unchanged. • Formatting such as font size, font style, font colour etc not disturbed. • Very useful for publishing industry and writers. • Any Punjabi font encoded file can be converted to Unicode. 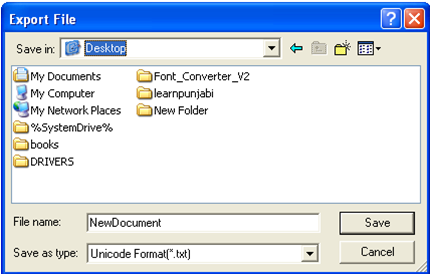 • Unicode text can be converted to Punjabi font encoded file. • Support for more than 125 commonly used Punjabi fonts. • Any Punjabi font encoded file can be arranged in alphabetic order according to Gurmukhi rules. 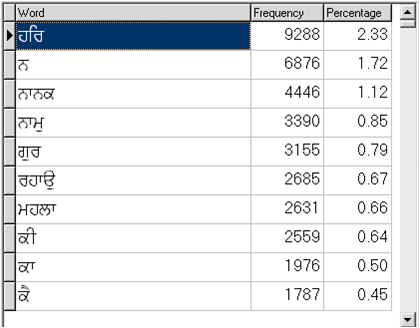 • Punjabi text in tables can also be sorted. • Sorting order can be ascending or descending. • Any Punjabi text in Gurmukhi script can be transliterated to Devnagri. 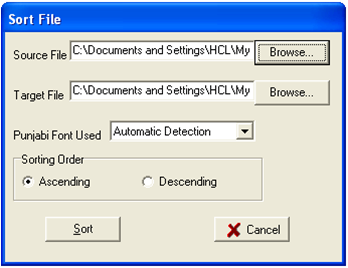 • Option to save the transliterated text in Unicode, ISCII or font encoded Devnagri files. • Useful for users who can understand Punjabi and Devnagri script but cannot read Gurmukhi script. • Any Punjabi text in Gurmukhi script can be transliterated to Roman. • Search for any word from Sri Guru Granth Sahib. All the occurrences of the word are displayed in KWIC (Key Word in Context) format, where the main word is highlighted and placed in centre along with its neighbouring text. • Display all the words from Sri Guru Granth Sahib according to their alphabetic order, order of occurrence or count. • Perform other statistical analysis such as count of running words and unique words, character frequency, mean word length etc. • Search for equivalent Punjabi administrative terms from a list of around 20,000 terms. • No need to type the terms in Punjabi, just select and paste them. • Very useful for routine official communication in Punjabi. • Punjabi Learners can use the Punjabi Typing Utility to learn how a word is written in Gurmukhi from its pronunciation. The Punjabi spell checker can help them in using correct spellings and the dictionaries can be used to know the meanings of Punjabi words in English and vice versa. • Punjabi writers can easily compose documents in Punjabi with no experience needed for Punjabi typing. They can also automatically proof read the documents using the spell checker and dictionaries. • Media persons including newspapers and printing press will find the font converter, unicode convertor very helpful. The spell checker will also automate the proof reading process. • The Punjabi typing utility, the search engine for Guru Granth and spell checker for Gurbani words will be very useful for creating and searching documents containing text from Gurbani.